Tsuchigumo means “ground” or “earth” spider in Kabuki and Japanese mythology. The spider was synonymous in the ancient Kojiki and Nihon Shoki chronicles with local indigenous renegade clans. The symbol later evolved into the yokai supernatural folkloric proportions that we know today. What was the origin of the tsuchigumo clan and where did the spider people come from? These clans were found from Yamato Katsuragi to the easternmost parts of Japan, and were associated with mounds and caves or rockcut catacombs. They were thus either indigenous descendants of the Jomon, or another settled tribe of Eurasian or Southeast Asian origin. The Chu (Zhu) state- (Zhou dynasty period) people in Southeast Asia had a spider as their totem and Chinese character name. Altaic shamans of Eurasia, in addition to deer and bird, sometimes also had the spider spirit as a key helper in their travels to the Underworld. Japan has no tarantulas or really large scary hairy spiders unlike the ferocious Southeast Asian ones. It does however, have the Argiope which is a species also known as the Orb-Weaver spider (see Orb-weaver spiders of the genus Argiope (Aranei, Araneidae) from Russia and Central Asia by Tiunov and Esyunin). The Japanese Argiope sp. (aka kogane-gumo) characteristically spins its webs very low from the ground, trapping its bug prey while deterring mammals from coming close. A Joro-gumo orb-weaver spider who takes the form of a beautiful woman, and who can either drown or protect people from drowning, is still known from the folklore surrounding the Joren Falls in the Izu peninsula in eastern Japan. From Lappland to Central Asia, the spider was a divine or lucky emblem, but large hairy or venomous spiders were also best known to the Central Asians who associated spiders with caverns and holes in the ground, and for whom, the Latrodectrus or the black widow spider, or another species called the Argiope, commanded the respect of peoples across Eurasia. The spider is also said to be associated with the Orion or Corona Borealis constellation from ancient Eurasia across the Beringia to the Americas (construed as astronomy-related myths or folklore of the Blackfoot and Cherokee and other tribes and a totem for the Hopi tribe(see p 181~183 Gary R. Varner’s Creatures in the Mist and How grandmother named the clans (from Bruchao’s Native American Animal Stories) and spider deity or cultural hero of the Oglala Lakota; see also the Spider Nazca lines of Peru, see also Varner). It is thus a moot point whether the clans were named for the local spider’s habits, for the indigenous descendants of the hairy Jomon, or the Satsumon, or whether they were so-named because spiders were already totemic identifiers of clans descended from the continental migrants. According to the ancient historian Motoori Norinaga in ancient Japan, Tsuchigumo was used as a derogatory term against aborigines who did not show allegiance to the emperor of Japan. 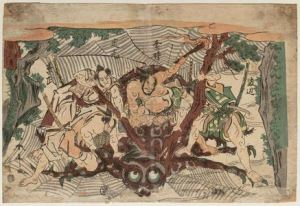 The opposing derogatory fearful and totemic benevolent depictions and descriptive use of the tsuchigumo spider icon might therefore possibly accurately mirror the historical animosity and antagonistic division between the warring factions of west vs eastern clans in ancient Japan. But who might these Tsuchigumo clans have been? Katsuragi Hitokotonushi Shrine (葛城一言主神社 Katsuragi Hitokotonushi Jinja) was said to be the remains where Emperor Jimmu captured tsuchigumo and buried their head, body and feet separately to prevent their grudges from harming the living. In historic Yamato Province, the unique physical characteristics of the tsuchigumo were that they were tailed people. In the Nihon Shoki, the founder of the Yoshino no Futo (吉野首) were written to be “with a glowing tail,” the founder of Yoshino no Kuzu (国樔) were stated to “have tails and come along pushing rocks (磐石, iwa),” presenting the indigenous people of Yamato as non-humans. 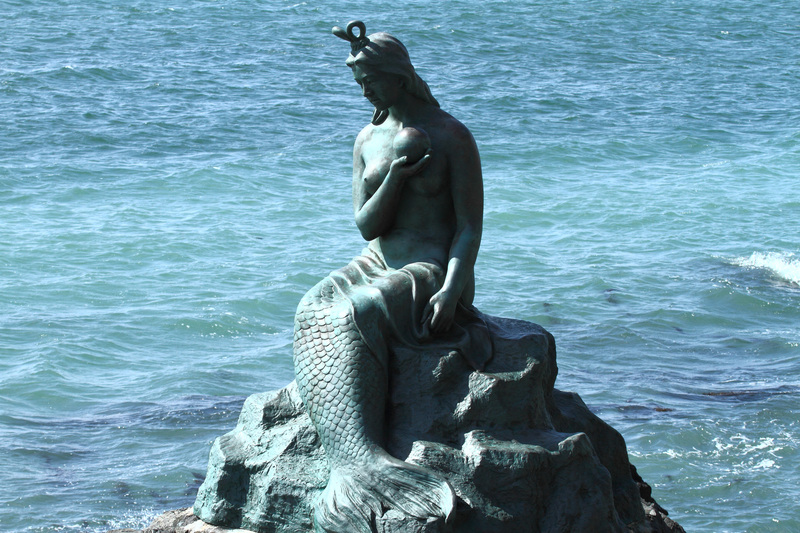 In the Kojiki, the people of Osaka (忍坂) (now Sakurai city) were “tsuchigumo (土雲) who have grown tails.” In the Hizen no Kuni Fudoki, there is an article writing that when Emperor Keiko made an imperial visit to Shiki island (志式島, Hirado island) (year 72 in the legends), the expedition encountered a pair of islands in the middle of sea. Seeing smoke rising from inland, the Emperor ordered an investigation of the islands, and discovered that the tsuchigumo Oomimi (大耳) lived on the smaller island, and Taremimi (垂耳) lived on the larger island. When both were captured and about to be killed, Oomimi and Taremimi lowered their foreheads to the ground and fell prostrate, and pleaded, “we will from now on make offerings to the emperor” and presented fish products and begged for pardon. In the Bungo no Kuni Fudoki, there appeared many tsuchigumo, such as the Itsuma-hime (五馬姫) of Itsuma mountain (五馬山), the Uchisaru (打猴), Unasaru (頸猴), Yata (八田), Kunimaro (國摩侶), and Amashino (網磯野), of Negi field (禰宜野), the Shinokaomi (小竹鹿臣) of Shinokaosa (小竹鹿奥), and the Ao (青) and Shiro (白) of Nezumi cavern (鼠の磐窟). Other than these, there is also the story of Tsuchigumo Yasome (土蜘蛛八十女), who made preparations in the mountains to resist against the imperial court, but was utterly defeated. Nor were the tsuchigumo were confined to eastern parts: According to writings in the Nihon Shoki, in the 12th year of emperor Keiko (year 82 in the legends), in winter, October, emperor Keiko arrived in Hayami town, Ookita (now Ooita), and heard from the queen of the land, Hayatsuhime (速津媛) that there was a big cave in the mountain, called the Nezumi cave, where two tsuchigumo, Shiro and Ao, lived. In Negino (禰疑野), Naoiri, they were informed of three more tsuchigumo named Uchizaru (打猿), Yata (八田), and Kunimaro (国摩侶, 国麻呂). These five had great amount of allies, and would not follow the emperor’s commands. By the 14th century, the period in which the Tsuchigumo Soushi (土蜘蛛草紙) was written, tsuchigumo appeared in the capital as yokai monsters. The commander Minamoto no Yorimitsu of the mid Heian era, known for the slaying of Shuten-doji, was brought by his servant Watanabe no Tsuna to go in the direction of Rendai field (蓮台野), a mountain north of Kyoto, where they encountered a flying skull. Yorimitsu and the others, who thought it was dubious, started to follow it, and arrived at an old estate, where there appeared various atypical yokai that agonized Yorimitsu and the others, and when dawn arrived, there appeared a beautiful woman who was about to trick them, but Yorimitsu, not giving it, cut it with his katana, and the woman disappeared, leaving white blood. Pursuing that trail, they arrived at a cave in mountain recesses, where there was a huge spider, who was the true identity of all the monsters that appeared. 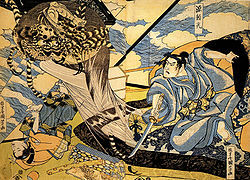 At the end of a long battle, Yorimitsu cut off the spider’s head (depicted in the woodblock painting above), and the heads of 1990 dead people came out from its stomach. Furthermore, from its flanks, countless small spiders flew about, and investigating them further, they found about 20 more skulls. What have we learnt about so far about the tsuchigumo? From all of the above accounts, the tsuchigumo earth spiders were clearly identified with opposing forces or groups of local native people that were being subdued by the Yamato rulers. 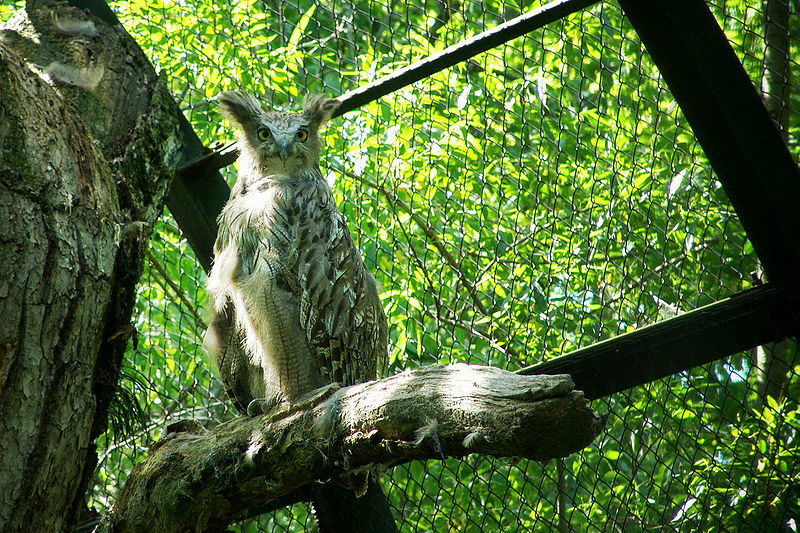 They were often mountain inhabitants and they were associated with caves and rockcut tombs. They were “stone-pushers” and mound builders. There were also tsuchigumo who lived on distant remote islands. Linked below is a blog post about the Kabuki retelling of the tale of the Defeat of the Ground Spider. This entry was tagged kabuki, tsuchigumo, tsuchigumo yokai.